Average Height	: 17" - 20"
Average Weight	: 32 - 55 lbs. The breed has its origins as a reindeer herder of the Sami people. The Sami are an indigenous people residing in areas now divided between Finland, Sweden, Norway, and Russia. Traditionally, reindeer herding has been very important for the Sami people, and they are still involved in herding today. The Sami have used herding dogs for centuries, and these dogs were typically long in body, somewhat rectangular in shape, with long hair and a straight tail that would curl up over the back when the dog was moving. Finnish Lapphunds are the most similar to the long haired dogs developed by the Sami people in order to assist them with herding, often favored as winter herders for the reindeer. Norwegians and Swedes were among the first to consider standardizing the dogs of Lapland prior to World War II.In the post war years, the dogs of Lapland were at serious risk due to distemper outbreak. Swedish Lapphund breeders today believe that their breed, and other Lapphund breeds, were in serious danger of extinction. 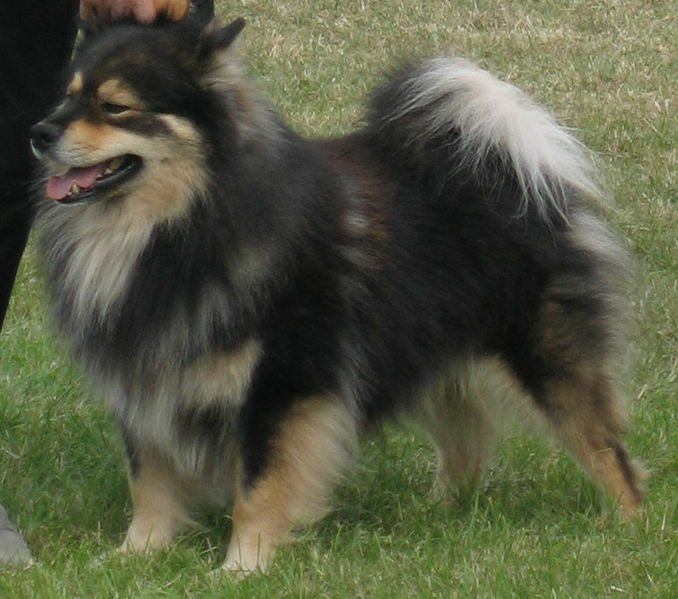 A standard for the related Swedish Lapphund was adopted in 1944 in FCI (Federation Cynologique Internationale), and the Finnish Lapphund standard soon followed. In Finland, the first breed standards were set in 1945 by the Finnish Kennel Club, who called the breed the Lappish Herder, also known as Kukonharjunlainen. It is believed that these dogs were the result of a cross between the Karelian Bear Dog and the reindeer dogs, and had short hair. In the 1950s the Finnish Kennel Association (the second major kennel association in Finland) created the first breed standard for the Lapponian herder. The breed makes the ideal outdoor companion. It is active, coldproof, and waterproof, and will gladly accompany people on walking or running trips. It is one of two breeds permitted to live outdoors in Finland. A slight independent streak is common, though with training Finnish Lapphunds can have excellent recall and obedience skills. Finnish Lapphunds clearly enjoy winters and romping in the snow. In Finland, many Finnish Lapphunds have won many national championships for obedience and experts feel this breed also would excel in Agility sports. The Finnish Lapphund is a naturally healthy breed, and typically lives 12–14 years, although dogs of 16–17 years are not uncommon in Finland. The Lapphund has a profuse double coat, with a short, fluffy undercoat and a longer topcoat. The coat makes the dog waterproof as well as resistant to extreme cold. In Finland, only two dog breeds are legally allowed to be kenneled outdoors in winter: the Finnish Lapphund and the Lapponian herder. The profuse hair around the head and neck gives the distinct impression of a mane in most males. Although the coat is profuse, it requires only a modest amount of maintenance. Weekly brushing is recommended throughout the year, except during shedding seasons, where a daily brush may be required. A wide variety of colors and markings are found in Finnish Lapphunds.